Cute DIY strawberry wreath by Sweet Parrish Place. 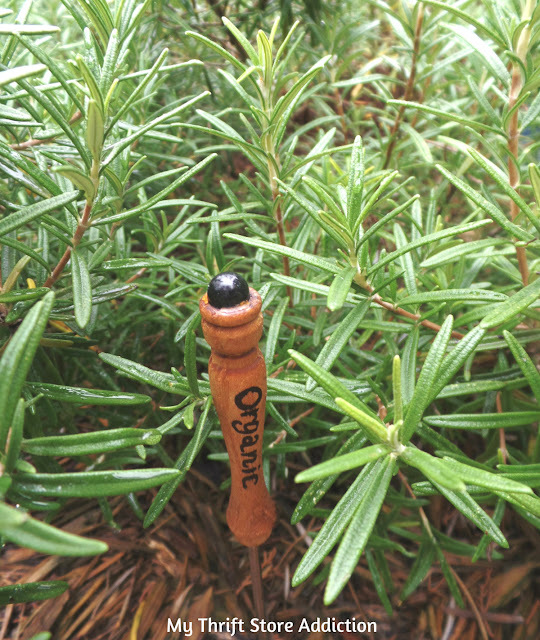 Cute idea for transforming fondue forks into garden markers by My Thrift Store Addiction. Here is a recipe for juicy cola burgers by Try Anything Once. Great features Kim!.....Not a good thing that you got stung multiple times by those yellow jackets and then the air conditioner has taken over being "broken"...hope the house cools down soon! thanks for hosting and have a better and cool week!!! glad you were able to outrun those bad critters! thanks for always having a great party, Kim. Kim, Those yellow jackets are vicious! Hope your A/C is fixed soon, it's too hot to be without. I am so sorry about your air conditioner and the yellow jackets. Yikes. I hope your foot is feeling better already. I'm not sure what's worse, the lack of AC or the yellow jackets. I think I'm going to go with the lack of AC. Yikes! Thanks for hosting. That Cola Burger is calling my name. Yellow jackets are just mean--I was stung a few weeks ago! Hope your foot is better soon. Thanks so much for featuring my fondue fork plant markers! OMG, I hope your air is fixed FAST!!! It is very hot here too, still 85 at 8:10. Have a better week!!! Ouch! Yellow jackets scare me to death -- sorry you had a run-in with them, and irritated your foot. Thanks for the party! A broken ac is no fun when it's hot like this. Hope it gets fixed for you soon. Thanks, as always, for hosting. Such cute features today! 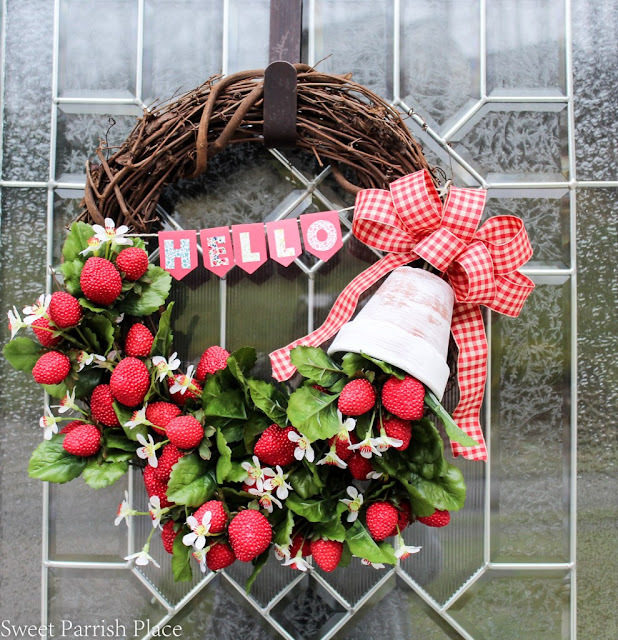 Love the strawberry strewn wreath!!! Thank you for hosting the party, as always. :) Happy to get back in the groove and link up. I hope this next week is the beginning of a shift in luck for you. Make it fantastic! Thanks for the party dear lady. You're amazing! Hope you are feeling better. The party must go on right! Thanks for hosting and I hoping that your trials are almost over. Try to have a good week and I hope it cools off. Hope your summer and coming week are much better. Thank you for hosting. Hi Kim! Thanks for hosting. Your home always looks so pretty, but I think summer in your house is my very favorite. Oh the joys of summer - don't get me wrong, I love summer but stinging insects and broken air conditioners aren't fun. Thanks for the party, Kim and hope your week goes much smoother. Hi Kim, hope you are feeling better. Yep, our 18 year old ac did the same about a month ago. It had gotten to 88 in the house at night, ceiling fans helped barely, ha. It was the fan motor outside, the blades stopped turning. We had to wait until the next morning but that guy got it up and running and we are good to go. Good luck! Kim, I am so sorry to hear about your air conditioning and the bees! I hope you get cool air going and your foot feels better! Thank you for hosting this party. Hope you iced your foot, running on a healing foot from yellow jackets was not in your plan! Thank you Kim for your 344th Wow Us Wednesday. Hope the AC gets fixed asap. Thanks for sharing my juicy cola burgers! :-) And for hosting. Have a good rest of your week!